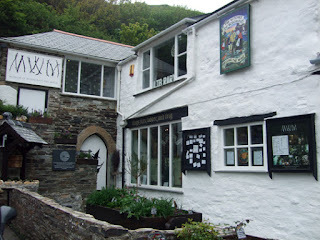 Judith knew Cecil Williamson, the founder of the Museum of Witchcraft and Magic, for last 10 years of his life and often visited him for afternoon tea in Devon. She said that at first she thought he wanted help with plans for selling the museum, but eventually realised she was being drawn into his “spider’s web” – a term he used as a metaphor for the museum and his magic. A knowledgeable magician, Cecil was also skilled at creating and stopping curses. He used the term: “Malificea finely ground.” By this he meant both the craft of things like grinding herbs, but also something being done finely. Judith’s said her talk was about a version of a cursing spell he taught her. The modern idea is that curses only work on a psychological level – using the idea that the victim knows a curse is being cast on them and so experiences a psychological effect as a result. In this case, that is not true, because the victim didn’t know about it. The world is full of wannabe magicians and witches who want to curse people from teachers to Trump, but the efficacy of the spell is measured subjectively in the minds of those doing them. Cecil’s spells really worked, Judith said. 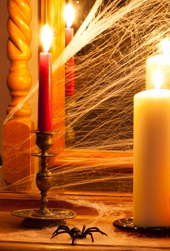 Very similar to spells most witches attempt, the spider’s web curse is a candle spell. You take a candle and mirror, prepare it and say words – you choose a suitable colour of candle, time and hour. You might anoint it with oil, then you scratch words on the candle with a needle, then poke the needle through it before burning the candle down in front of a mirror. Cecil’s addition was the spider and the spider’s web. Before you do spell, you collect a spider’s web and pay the spider a silver coin for doing the spell. It is difficult to collect a spider’s web and put it on a mirror – so you have to focus your mind. Everyone has a spider and its web in their house. You do and so does your victim. 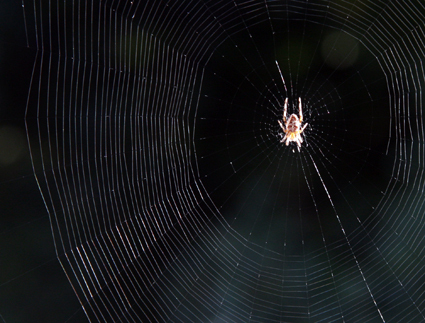 You use the web to transmit and attract, from the spider you bought the web from to the one in the victim’s house. It passes from one to the other, but in the middle is the essence of spider. You must meditate on the essence of spider to make it really work. It is a very shamanic spell, but Cecil was not a shamanic type of person. It is the kind of spell you need concentration to do, not just do on a whim one night. Cecil frequently spoke about attracting and transmitting being a two-way process. Another example of a spell using techniques of attracting and transmitting is sitting on a swing over smoke and using the to and fro action to charge your intent. What did Judith do with the spider’s web curse? At the time Judith was a friend of a woman who was being bullied by someone in senior position to her at work. The friend was so upset she asked Judith to help. She used Cecil’s spell that evening without thinking of the potential consequences. She did spell in back porch where there were lots of spiders, left 5p for the spider, concentrated on the pull and transmit action, meditated on meeting the essence of all spiders – which was a bit scary - and transmitted the spell. Then she left the candle to burn down. You should never think about a spell when you have done it. The next morning she heard that the bully had done something about half an hour after the spell was cast that had led to them being sacked for gross misconduct. Judith’s friend was pleased with the outcome. However, the after-effects on Judith were damaging. For a long time afterwards she was very tired and disorganised. She suffered from crying fits, loss of appetite and was mentally and physically exhausted. In Judith’s opinion, the only thing that could have caused this was the spell. He taught her about magical detachment - think about whether what you do is for the right purpose. Judith says she does not have moral issues about cursing the bully, but she didn’t think through the effect on her or prepare for it. Judith said that Cecil had an extensive practice of working that kind of magic – he would perform curses on people he didn’t know and so didn’t have connection or attachment to. He did this kind of magic to the end of his life. He also said he only turned down requests for "black magic" if the person asking was mentally unstable. While I was at the conference I bought a copy of the book Cecil Williamsons Book of Witchcraft: A Grimoire of the Museum of Witchcraft by Steve Patterson, which offers more insight into Cecil's practices.